THE ROAD TO KHALISTAN: Would You Bring Hitler To Justice? Would You Bring Hitler To Justice? Going through my e-mail, I came upon this editorial from The Panthic Weekly. It contains ideas I have often thought about, so I present it to you. I noticed that their reference to the [person] generally known as 'KPS Gill' left out the 'S.' At first I thought it was a mistake or a misprint - until I considered that the 'S' stands for 'Singh,' a name Gill has forfeited all rights to. Very good, Panthic Weekly, and thank you! If you could go back and Bring Hitler to Justice—before the Holocaust, before Kristallnacht, before any of it—Would you do it? Would it be wrong? Well, Kim Bolan of the Vancouver Sun seems to think it's wrong. In recent articles by the "reporter" in the Vancouver Sun, she has slated Sikhs, as a community, for respecting those that died to prevent horrific genocide—to stop those that would kill every man, woman and child out of hate for their beliefs or origins. 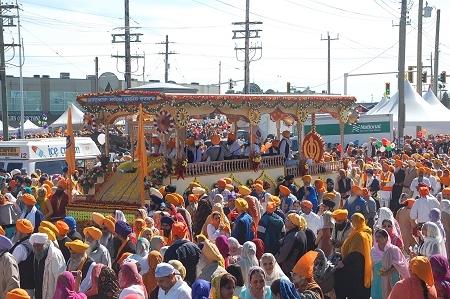 In the past few years, the Surrey and British Columbia governments have decided that free speech doesn't apply to the Sikhs. They have asked us to stop respecting our heroes, those that died for what they believed in, equality. They have asked us to forget our rich history of sacrifices for righteousness. They have asked us to give up our core beliefs and values because they don't fit in with their politically correct, diplomatic visions. However, this policy of forgetting the past causes many Sikhs to believe that Canada and other Western Nations are more concerned with economic deals with countries like India and China regardless of their human rights records. India: a country where University students admire Adolph Hitler as one of their top three heroes while denying The Holocaust ever happened. It is well known in India and throughout immigrant communities that Indira Gandhi and her government had a clear cut plan to "unite" India at all costs, including sacrificing civil rights for Sikhs, Muslims, Christians and other minorities. One of the first objectionable actions by the government dates back 30 years when the government openly supported the creation of an anti-Sikh cult, that was guarded by a heavy para-military contingent that marched through the holy city of Amritsar. The march included derogatory words and actions by the cult leader as he openly defamed Sikh Gurus. When the Sikhs peacefully protested for them to stop, they were gunned down—mercilessly slaughtered. Sikhs tried to file police reports regarding the incident and they were turned away; justice denied. Yet Kim Bolan and various authorities seem to want to deny justice again by having us remove and denounce pictures that highlight their sacrifices. However, what followed has left deeper wounds in the hearts of Sikhs. Operation Blue Star—not just an attack on Amritsar, but a series of simultaneous attacks on DOZENS of historical temples across Punjab—was meant to strike at the very heart, physically and emotionally, of the Sikhs. After that, riots were planned in the streets of major cities, as mobs were given voter rolls to identify Sikh homes and businesses, then more attacks. In 1984, after witnessing the carnage of government run genocide across their state, targeting their people, "assassins" took it upon themselves to stop what they saw as wrong. Wouldn't any reasonable person when faced with untold numbers of innocent people facing torture and death at the hands of a hateful regime? The justification worked in World War II when The Allies stormed the beaches of Normandy, it's the same justification Bush used for the Iraq war: Stop those that would mercilessly slaughter thousands of innocents on a whim, before they are allowed to carry out their heinous crimes. Israel was created to stop hate against the Jews, Tibet should be free to stop persecution of a people because of their beliefs. Tibet in China is no different than Punjab in India—a people persecuted and oppressed by their own government. Unfortunately, some of the plans still came to fruition. 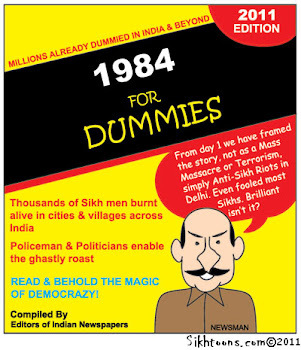 With the death of Indira as an excuse, the Sikhs faced their very own Kristallnacht. However the history of a people and a religion that has continually faced persecution for hundreds of years seems to be irrelevant to Kim Bolan. They are assassins because they killed someone she admires. Kim Bolan's allegiances suggest that she doesn't frown on genocide. In fact, one of her known associates in the "Sikh" community is K.P. Gill, the so-called "supercop." She respects him for putting down what she calls "terrorism." What she doesn't seem to care about, is how this so-called terrorism was put down—torture, genocide, murder, mass graves, Gestapo-like tactics. This mass murder is condoned, and even admired by a reporter who doesn't bother to investigate the facts and clearly injects her strong bias and opinions into her articles. Some may forget that at one time George Washington was a terrorist according to the British. So was Gandhi. In fact, Nelson Mandela famously quoted Gandhi in 2000 stating, "Where choice is set between cowardice and violence, I would advise violence…I prefer to use arms in defense of honor rather than remain the vile witness of dishonor." If standing up for what you believe in, if putting your life on the line to save others, and if asking for human dignity and the right to free speech and freedom of religion is terrorism. Then we are terrorists. Had the Americans lost the Revolutionary War they would've been known in history as assassins and terrorists, but instead they are looked up to across the world as symbols of freedom and liberty. What Kim Bolan doesn't seem to understand is that the majority of the Sikh community worldwide thinks she is a joke. The majority of the Sikh community, unlike the puppets she almost exclusively quotes, understands these issues and why we respect our martyrs. First it's Jathedars Talwinder Singh and Sukhdev Singh Babbar who fought for the right to exist, then Bhai Fauja Singh who peacefully protested and was shot down, then it's Guru Gobind Singh Jee, who taught us that laying down and allowing oppressors to step all over you is not right and freedom and justice are principles a person can never give up. Will you ban them all? Kim Bolan described Khalistan as "a mythical nation Sikh separatists want carved from Punjab." 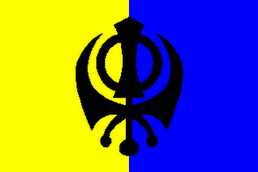 Perhaps Khalistan is a state of mind, perhaps it is a myth. Or perhaps it's the Empire built by our forefathers before the British came in and created the "mythical" state of India which later split our kingdom into the "mythical" states of India and Pakistan. Perhaps we just want to be left alone and have the right to self-determination—to exist—the right to free speech and the right to religion. Would you deny us that in your free democracy as well? Fortunately, in the democracy set up in Canada—our country too—even a minority's voice is heard, whether it be Kim Bolan or Sikhs calling for 'Sarbat da Bhalla," peace for the entire world and all who inhabit it. If you could go back and bring Hitler to Justice—before the Holocaust, before Kristallnacht —Would you do it? Would it be wrong? Kim Bolan of the Vancouver Sun seems to think so. In recent articles by the "reporter", she slated the Sikh Nation for standing up against evil and tyranny. "If you could go back and bring Hitler to Justice—before the Holocaust, before Kristallnacht "
Most other liberally-minded people give me a strange look when I give that response to this question. If it were now 1945 or possibly even 1960, I would answer in the affirmative but now in 2012, I cannot. When I think of the millions of people who now exist because of Hitler's actions. Whether it is because their grandparents or great-grandparents were GI Brides, because without moving to Israel their grandparents wouldn't have met each other, because their grandparents fell in love when one was a refugee or an occupying soldier in the other's country, etc., who am I to say these people shouldn't exist? Apart from the love that has come to exist as a result of Hitler's atrocities, the Jews now have a homeland (however atrociously it behaves at times), the EU, for all it's many faults, has made war between nations in an ever expanding part of Europe almost unthinkable; and it is now impossible on most of the continent to express fascist views without derision and being socially ostracised except in very narrow social groups. So no, from 2012 I would not go back and assassinate Hitler but if I had jumped forward from 1932 to 1945 and then returned, I absolutely would do. The positive (unintended)after effects of Hitler have taken many decades to show in Europe and to go back to the point of your original post, this is something I don't see in India yet. I suspect false equivalence is being drawn as the first treaties that lead to European integration had been signed within 15 years of the end of WWII, although it now seems too late for the events of 1984 to be a point of integration for a shocked and stunned subcontinent. In short, I don't think that the murder/assassination/execution of Indira Gandhi was unjustified. You also have my deepest sympathies for what you, your family and your fellow Sikhs went through afterwards. In the interests of full disclosure, I am an English atheist, who has been doing disjointed research into Sikhi after reading Bertrand Russell's comments on it. I was raised as a Christian and have previously researched Islam, Buddhism, Taoism, Wicca and Ásatrú. I intend to get round to researching Hinduism, Judaism (I've not read any of the Talmud) and Confucianism at some point. Of all that I have studied I have found Sihki to be the most compelling and most beautiful. Sikhi seems to draw on a lot of the Humanist/Epicurean ideals I hold dear. Unfortunately it also posits that the supernatural exists and I really struggle with that idea. Anyway, I want to thank you for your blog. I am working backward through it and know you are no longer updating and so don't know if you will ever see this message. I remain unconvinced that Khalistan is a good or bad idea, perhaps if it had been created in 1947? It seems a great romantic ideal but it is hard to see how it would thrive sandwiched between two hostile neighbours and with no sea-port of it's own. If you are still reading responses to this blog, I am sorry this is the first one I have responded to. It's just that the Hitler question is one I have considered before and come to (even to me) a surprising conclusion to and so felt the need to share. Sorry for this rambling post and I wish you all the best as you struggle with the realities of your life. May your meditation on Waheguru continue to bring you much comfort. Yes, I still receive responses and read them. Sometimes I answer. You can also e-mail me at the address above. I posted this article because I thought it interesting. I personally don't believe in prosecuting people for crimes that have not yet been committed. That is a bit too much Orwell's 1984ish for me. Kim Bolan, however, has long been hostile to the Sikh community and has earned a place in my bucket. I would like to slap that silly grin off her face.